This multi-tool is the perfect companion for all gardening adventures. Pound in stakes with the flat pommel base, measure planting depth with the handy inch marks, saw a branch or whittle some kindling with the rust-resistant, double-edged blade. The Hori Hori Ultimate Tool is built with a walnut handle and heat-treated, stainless steel body won’t be leaving your side anytime soon. Dimensions: Hori Hori: 5.5" x 3" x 13.5"; Hori Hori + Sheath: 5.5" x 3.5" x 17"
Weight: Hori Hori: 1 lb. ; Hori Hori + Sheath: 2 lbs. Outstanding tool. Gave it as a gift. Barebones Living believes in building quality gardening tools, and their durable gear—like a spade, hoe, the multi-functional Ultimate Tool, and Harvesting and Gathering Bag—can easily handle digging in the dirt and many more tough jobs. Founder Robert Workman applies the Shaker philosophy (creating things that are equal parts necessary, useful, and beautiful) to his well-made tools. 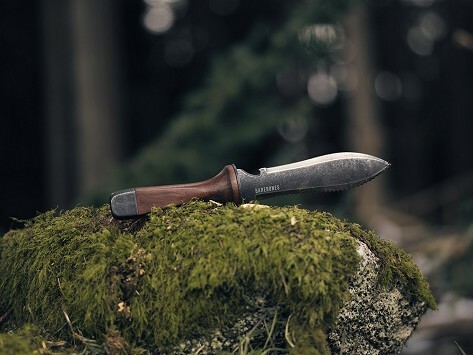 His designs have a minimal-but-functional feel, and are made with strong, long-lasting materials like tempered stainless steel and walnut to handily dig, weed, till, and tackle other dirty jobs without wearing down. Barebones Living was created to support Robert’s own non-profit. They now give back to marginalized people—from providing shelter after natural disasters to helping fund mobile medical clinics. For all the good these tools do in your garden, they’re also making a positive impact around the world.